For many foreigners living in Japan, giving up smoking in Japan likely presents a comparatively stiffer challenge, or conversely, plenty of reasons to give up giving up. This despite attempts to create a smoke-free environment ready for the 2020 Tokyo Olympics and Paralympics. Japan is one of those countries in the world where you’re less likely to be aware of "World No Tobacco Day." In fact, people here are more likely to be made aware of “Pocky Day” or “Good Married Couple Day” (both in November which perhaps says something about that month’s desperate lack of appeal) or some other novelty day based on a tedious pun. Anyway, World No Tobacco Day, May 31 (every year) -- 24 hours out of the year when the World Health Organization (WHO), and their partners, encourages smokers to kick the habit, if only for a day. Japan must be one their most frustrating challenges, the recalcitrant kid at school who has all the talent to go places but for whatever reason, doesn’t want to play ball. And this expat kind of wishes it would, for it would make it so much easier to stop, or stay stopped. The stats are in place. According to the same WHO, in 2015 33.7% of males, 15 and over, in Japan were smokers. It’s a stat that sees Japan keep the company of Burkina Faso on one side (36%) and Honduras on the other (33.3%), and this even though you have to be at least 20 years old to legally smoke in this country. Women fared better (although holding of a similar global rank) at 10.6%. Either way, this expat was one of them (if the stats included foreigners -- I don’t remember being asked). Emphasis on the “was.” I’m now a no smoker. Not that I was a very heavy one in the first place but in the process of packing it in I became even more acutely aware of how hard it is to do so in Japan. But this isn’t a sob story, or a tale of sweaty hardship deserving of a round of applause. It’s simply a telling of how Japan, still, despite all the cheers for a smoke-free 2020, makes life very easy for the smoker which might serve as either a cautionary tale for others, or, indeed, a promotion of Japan as a place to come and smoke (which it emphatically isn’t meant to be). Smoking in Japan is still comparatively cheap. 470 yen for packet of 20 Marlboro Menthol Lights. At current exchange rates that’s 4.29 USD, 3.16 GBP, 3.59 EUR. For many foreigners in Japan, it’s cheap, is what it is. In the U.K. the average price for a “pack of 20” is over 1,500 yen. At that kind of price you’d have to be both stupid and rich to start smoking, and really addicted to not at least try stopping. OK, so 470 yen isn’t screw-it-I’m-backpacking-around-Southeast-Asia-cheap, but in Japan and on a salary, 470 yen isn’t so heavily missed, especially if you’re only on one or two packs in a week. At least, it can easily be compensated for (skipping a couple of fancy coffees, one less beer on a night out … ). In fact, I’d venture to say that some foreigners, new to Japan, may even take up smoking precisely because it is so cheap. "In Japan, cigarettes are on proud display behind convenience store counters, and you don’t even have to ask for them by name." On a personal level, and in practical terms, one of the greatest challenges facing the would-be quitter in Japan must surely be smoking’s accessibility. In the 5-min walk between my place of work and the train station I can chart a course that would take me past two or three clearly designated smoking areas and three or four cigarette vending machines. We can add to this the convenience stores on seemingly every corner of Japan’s streets where cigarettes are sold openly from behind the counter, not under it, and something as seemingly innocuous as a brief walk to the station is turned into a clammy, jittery nightmare for those fighting the addiction. Let’s stay with the vending machines, that most Japanese of phenomena where cigarettes are available at the push of a few buttons along with booze, sugared-up coffee and, apparently, someone’s used underthings. It tells you the degree to which Japan is playing catch up in the smokin-ain’t-cool-anymore appeal when we consider that it wasn’t until 2008 that smokers in Japan (of any age) were no longer able to purchase cigarettes from vending machines without the use of I.D. While application for the I.D., known as TASPO (Tobacco Passport), may pose something of a stumbling block to the would-be foreigner smoker (another layer of paperwork to add to the Himalayan pile presented by life in Japan), it probably says a lot about a society’s priorities that the application process for a foreigner’s ability to get hold of cigarettes is made far more accessible and gentle (English-language instruction readily available) than that for getting a credit card, and acceptance far more likely to boot. At the time of TASPO’s introduction there were 570,000 cigarette vending machines across Japan. The Tobacco Institute footed the bill for getting vending machines “TASPO” ready which reports say came to around 90 billion yen. And the smoker (or just-quit-an-hour-ago tentative non-smoker) can’t really fall back on that age-old adage of, “When you really need it, you can’t find it.” Japan’s cigarette vending machines are conveniently placed for when we most need them -- in the car parks of sightseeing spots, around any transportation hub you care to mention, highway service stations, love hotel lobbies, and immigration offices (especially immigration offices, where even the most militant non-smoker begins to question their faith). It’s almost as if someone put them there on purpose. Even without a TASPO, or any form of I.D. though, getting cigarettes in Japan is a breeze. Step up the convenience store and the touch-screen age confirmation system. In Japan, cigarettes are on proud display behind convenience store counters, and you don’t even have to ask for them by name. They all have numbers, and even the most English-language-challenged store staff here in Japan can count from 1 - 10, not to mention that learning a few numbers in Japanese presents scant deterrent for anyone who wants a cigarette. Then there’s the question of age verification. Leaving aside the highly unlikely prospect that convenience store staff would have the cojones, or language skills, or motivation, to question a foreigner’s age, they don’t have to anyway. That responsibility has been palmed off onto a machine (when cigarettes are scanned an “age verification” button appears on the screen of the cash register which customers then have to press for the transaction to conclude and to assume responsibility for their (un)expressed age). It’s a stroke of genius really -- no moment of shame for the baby-faced university student, and no bile-inducing fear of verbal abuse aimed at someone who really isn’t paid enough money to have to face it. Everyone wins, except the poor sods trying to give up the cigarettes. So, now that we’ve dealt with the limp challenge to getting cigarettes that is presented by Japan, we discover that it’s almost just as easy to find a place to smoke them. In the climate of smoking no longer being cool (if it ever was) and an ever diminishing portfolio of real estate in which it is permitted, the clearly labelled / designated smoking area is an increasingly vital resource for the socially conscious, polite, and sensitive smoker. This highlights a key factor in the enjoyment of smoking, that it can easily be spoiled -- adverse weather conditions, the wrong brand, forced to smoke on the sly … and smoking in areas where your not sure that it’s OK to do so. For the smoker then, Japan, with its smoking bus shelters, public ashtrays in leafy disguise, and anonymous fenced-off corners, must appear like one of those places you see in the movies -- a utopian world beyond some magical portal in which you’re free from persecution, death-stares, and guilt-trips. And the smoker can know that while in other of the world’s industrialized nations those with the power to enforce change are doing so, here in Japan smokers have government on their side. In the calls to make the 2020 Tokyo Olympics and Paralympics “smoke-free,” members of government have been holding firm against the ideal. Proposed bills, that have even allowed for smoking in restaurants and bars but in separate smoking areas, have thus far had trouble getting off the ground, having been amended to something far less satisfactory for many which, as things stand, will still allow punters at around 55% of restaurants and bars across the country to spark up without having to go to a separate smoking area. This lead the Tokyo metropolitan government to seek its own, more stringent, ban on smoking in the capital which, if it comes into effect, will see around 84 percent of bars and restaurants become smoke-free. The Tokyo government’s plan will be submitted to an assembly for consideration in June. Reluctance on the part of Japan’s lawmakers to fully embrace bills that propose bans on smoking might be due to the government’s relationship with cigarette manufacturers, according to anti-tobacco campaigners. 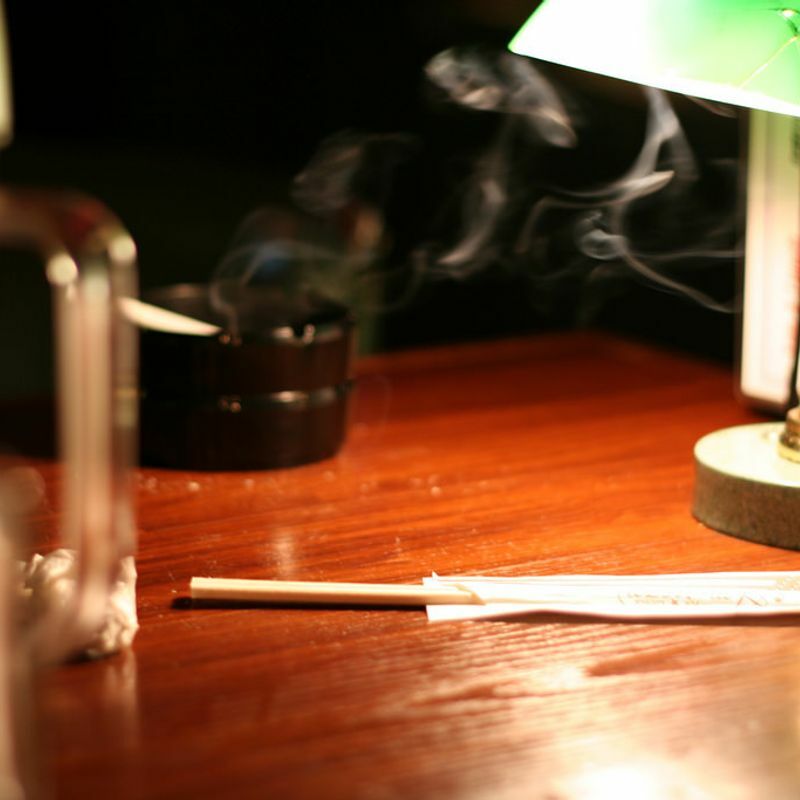 Japan Tobacco, the largest such manufacturer in Japan, benefits from a one-third stake in its ownership as being from Japan’s finance ministry. As in other countries around the world, citywide, even nationwide bans on smoking in Japan do have an air of inevitability about them, and this expat has noticed a significant shift in attitudes towards smoking in Japan in the last couple of years. However, at current speed, it seems that by the time the 2020 Olympics and Paralympics rolls into town, Tokyo will be far from smoke-free, if it even should be in the first place. In the meantime, it still seems easier to find bars, restaurants, and coffee shops across Japan in which smoking is permitted, than those in which it isn’t. "... one can’t help but feel that really what is happening in the case of Japan’s appeals to manners and etiquette, is in fact an offer of accommodation to the smoker and little more than an attempt to placate anti-tobacco campaigners and other voices of concern ..."
I recall a TV commercial here in Japan in which smokers and non-smokers were getting on like best friends in some dreamy utopia in which one could come to believe that smoking has no chance of killing you, it’s just that some people don’t like the smell. Cue scenes of BBQs at the beach where the smoker in the group waves over to his mates that he’ll be along in a minute, as soon as he’s finished his cigarette, and everyone waves back in appreciation of just how polite he is. Turns out it was an ad for Japan Tobacco. Something about smoking politely. When it comes to smoking, you don’t have to know much, if anything, about policy, about bills submitted and rejected, or about politicians and their relationships with industry leaders to be able to a get a fairly good sense of how tolerant a nation is towards it, in practical terms. In Japan you can see people smoking everywhere, outdoors and in. And you can also see that the approach towards curbing it doesn’t really exist. The focus instead is on passive smoking. So, the smoker in Japan, instead of being bombarded with images of charred lungs and rotten teeth, is instead inundated with, sometimes bizarre, appeals towards smoking with manners. We’ve all seen them by now, posted on social media for their odd use of English, the chirpy slogans and graphics slapped onto the sides of public ashtrays -- “I moved to avoid him. But my smoke didn’t.”, "I carry a 700°C fire in my hand with people walking all around." et al. And while fighting for the cause of the passive smoker is something to be championed in the strongest terms, one can’t help but feel that really what is happening in the case of Japan’s appeals to manners and etiquette, is in fact an offer of accommodation to the smoker and little more than an attempt to placate anti-tobacco campaigners and other voices of concern (especially when we consider that Japan’s etiquette offensive is lead by Japan Tobacco). And it certainly doesn’t get to the root of the problem, i.e. people who smoke and their addiction to doing so, presumably because they’re off limits for now. So for the smoker in Japan then, the explicit message is all too easy to interpret as, “Smoking is fine, just make sure you do it in a designated area, so as you don’t bother others.” Anyone who’s ever tried to give it up will know that this is exactly the kind of reasoning that makes it so hard to do so. But I mentioned earlier a sense of significant change in the air, and one that offers promise to those trying to kick the habit. In recent years government surveys have revealed numbers of smokers in Japan to have fallen below 20% of the population (for the first time on record). Reflecting this, Japan Tobacco earlier this month published their first quarter results for fiscal 2018 in which they reveal a 15% decrease in cigarette sales volume compared to the first quarter of the previous year. We also learn of companies in Japan harboring an increased sense responsibility to look out for the health of their employees (Yahoo Japan Corp. plans to remove all of its smoking rooms in 2020) as management converts office smoking rooms into smoke-free lounges and sends everyone out for a lung-busting lunchtime jog. Call it gearing up to 2020 or a spreading millennial conscience, but smoking in Japan seems more and more limited to the realm of the old geezer who spits on train platforms, doesn’t care much for change, and smokes wherever he pleases. The problem is, for the already addicted who might be blinded to change, and the giddy Japan newbie who’s not had chance to become aware of it, this country remains a smokers paradise of sorts. Have any experience of smoking / quitting smoking in Japan? Let us know in the comments.